With NaNoWriMo in full swing, I have found myself reading a lot of articles and blogs chop full with tips. Of course, most of these tips should be taken with a grain of salt. Why? Because the do’s and don’ts of the writing world is never consistent. I feel like the writing career is the only career where there really is no guideline. We are just a bunch of people that write stories. We are the few people that hear the voices and chose to write their stories instead of calling ourselves crazy or ignoring them. The biggest case that annoys me is all of the articles and blogs that talk about dialogue. 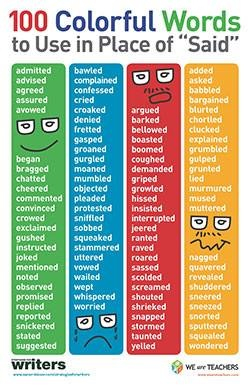 Most people say that for new writers or writers trying to break into the publishing world should avoid using words like “yelled” or “shouted” or “whispered.” They suggesting sticking with the good ol’ “said.” They say that we should be showing our readers instead of telling. I say it’s all Bull Hockey! And here is why. How does the reader know that a character is whispering? How do you even show that a character is whispering? She leaned in and kept her voice low. Maybe I am just not creative enough to show whispering. How about when someone yells? Sure, I can add the punctuation there, but if we are going on advice from others…they even say using an exclamation mark should not be used in dialogue. How do you show a reading that your character is shouting with out saying they are shouting or using proper quotation marks? In this instance, how does my reader know if the guy in the sentence is shouting or doing one of those clam, quiet, mad-enough-to-kill-you voices? There is nothing there to tell you. He could be mad enough to yell or he could be so mad that yelling isn’t going to cut it. Here is my theory on the whole thing. Just write!! I read so many books where rules are broken. This author used an “ly” word. That author said the character bellowed. The author over there has used the same word repeatedly through their entire novel and while it’s annoying, I will let it pass because the publisher thought it was a good book. No matter how you write, it’s all about the story. If the story is interesting, the rest will come later through edits and revisions. The most important part is to get the story down the first time. Later, worry about this and that. Later worry about what rules you are going to break and what rules you feel the need to follow. Honestly, most of the rules just seem like more ways to dissuade a person from writing, more things to make us question if we can make it in the writing world. Now, restore that confidence in your story by reminding yourself that the first draft is called the rough draft for a reason. It’s rough. It needs a ton of work. Just get the story down first. Let’s get those first drafts done!